If you have already gobbled up part 1 and part 2 of our presentation, we are here to provide you with our final instalment in this series regarding umpire signals in American football. With these three instalments we hope to give you enough ammunition to help you understand the game of American Football and EFLI better. The call for illegal batting is generally called on the offense. It involves any intentional batting of a loose ball or ball in player possession. Penalty for such an offense is generally 10 yards. For batting a ball forwards, either when in player possession or a backwards pass, this is a 15 yard penalty from the basic spot. Batting or kicking a loose ball usually also attracts a penalty of a Loss of Down. Batting is only allowed in certain situations, such as blocking a kick or deflecting a forward pass (any eligible player may bat a forward pass in any direction). By the Referee to indicate that a penalty has been declined. By the covering official to indicate that a forward pass has fallen incomplete (failed to be caught by the receiver or under/overthrown by the quarter-back). The term penalty refused/declined is used when the team against which the foul was committed decides to not take up the case as it would rather harm them if they call for the imposition of the penalty – a touchdown scored at the end of a play in which a personal foul was called. The offense would rather prefer it that the score of six points is counted rather than getting a fresh set of downs. This may also be against any player on the defensive side who makes a forward pass following a change of possession. For types 1-3 above, the penalty is generally considered from the spot of the foul and will attract both a 5 yard penalty as wells as a Loss of Down. For type 4, it will be a 5-yard penalty from the spot of the foul. 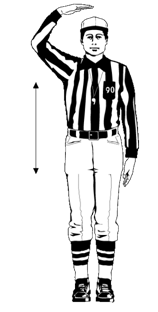 This signal is used by the Referee to indicate that a forward pass has been intentionally thrown by the quarter-back where no eligible receiver could reasonably catch it to avoid a sack. There is no penalty in terms of yards for this; however a Loss of Down is adjudicated at the spot of the foul. 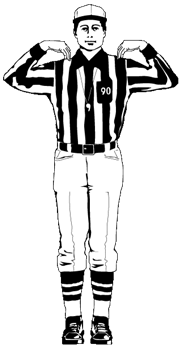 This signal is used by the covering official to indicate that in his judgement the forward pass was uncatchable. This may negate any pass interference calls made in the vicinity of the intended receiver. A valid fair-catch signal is the extending and lateral waving of one arm at full arm’s length above the head by any member of the receiving team. An invalid fair-catch signal is any signal by a receiver before the kick is caught or recovered that does not meet the requirements of a valid signal; made after the kick has touched a Receiving team’s player; or made after the kick has touched the ground. An illegal fair-catch signal is also any signal by a runner after the kick has been caught or after the kick has been recovered. The result is a dead ball with a five-yard penalty from the spot of the foul. A player is called offside when any part of a player’s body is beyond the line of scrimmage or free kick line when the ball is put into play. A defensive player is called for encroachment when he crosses the line of scrimmage and makes contact with an opponent before the ball is snapped. A defensive player is called for Neutral Zone Infraction when he jumps offside and causes an offensive player to commit a false start. The penalty goes against the defense rather than the false start against the offense. All of these result in penalties of 5 yards. 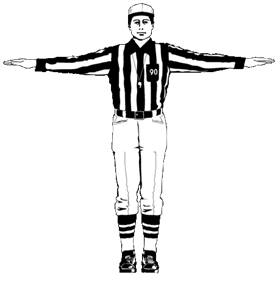 This signal is used by the Referee to indicate that there was illegal motion towards the line of scrimmage by a member of the offense (he may only be going parallel or backwards when the ball is snapped). It is also used to indicate an illegal shift by the offense, when both hands are used simultaneously – i.e. more than one player was still in motion or that the offense had not set for one second after a shift and before the snap. 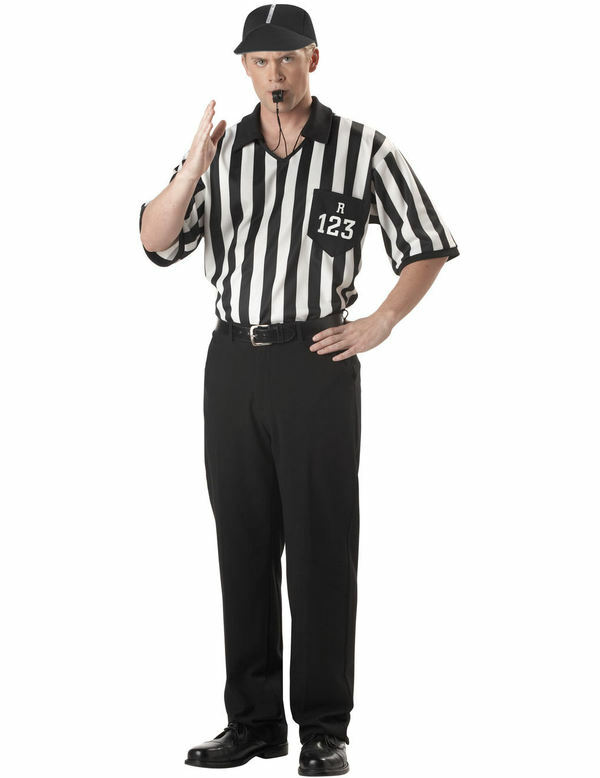 This signal is used by the Referee to indicate an act of unsportsmanlike conduct or other non-contact foul has occurred. This may include taunting a player from the opposing team and celebrating touchdowns in an inappropriate manner. This is also used when a player has deliberately contacted an Official. These fouls are usually considered to have no impact on the outcome of the play and are hence treated a dead-ball fouls. They attract a penalty of 15 yards. The final and most extreme step a referee can take on the pitch. This signal is used by the Referee to indicate that a player (or anyone who is entered on the roster) has been disqualified from the game. This decision can be made if anyone bad mouths, physically assaults any official on the field or does anything that is extremely derogatory to the game. This ends our series on refereeing signals in the game of American Football. While these are surely a lot to take in, a rendezvous with the game itself will surely help you get you in touch with all the calls they make on the field. I sincerely hope that these will help you get acquainted with this exhilarating sport even more.